This book had always sounded intriguing to me and after buying it recently, I’d been meaning to read it. When the fabulous Lucy from The Queen of Contemporary announced that it would be one of the books being read for the UKYA Book Club throughout June, I saw it as my chance to finally pick it up! This story follows Kate Finchley and Matthew Galloway throughout several different time periods. The pair keep meeting and falling in love during crucial points in history, and both are eventually pulled apart by death. For that reason, no matter what time they’re in, they never get to live out the rest of their lives together. As their timelines start to merge, their different reincarnations try to figure out what is going on and why this keeps happening. The Next Together is packed full of interesting storytelling. The notes between Kate and Matthew in 2019 were a great way to show their story, as well as articles, letters and newspaper clippings from all different periods, including 2019 Kate’s blog. These little inserts made the story extra exciting and they definitely kept me hooked. Also, the little computer messages about progress and interventions throughout the chapters were quite chilling and made me desperate to find out who or what was behind all of this. As for the characters, I simply adored them, in every single time period. Although we only get told 2019 Matthew and Kate’s story through articles and notes sent between them (oh, and even a PowerPoint presentation) I still felt like we got to know them simply by their interactions. Their notes provided a lot of humour, and since it was the year closest to our time, their language was current and hilarious. The other time periods were just as brilliant and it’s impossible for me to choose a favourite. The final few chapters were intense and fast paced, with a whirlwind of emotion thrown at you from every reincarnation of Kate and Matthew, and there are a few twists that I definitely wasn’t expecting. By the very end, there were still questions I was dying to have answered, and it’s made me extremely anxious to get my hands on the next book! I simply adored the writing style of The Next Together. It was clever, unique, and super intriguing. If you haven’t managed to give this book a read yet, then I highly recommend you check it out because it has a little bit of everything to offer. 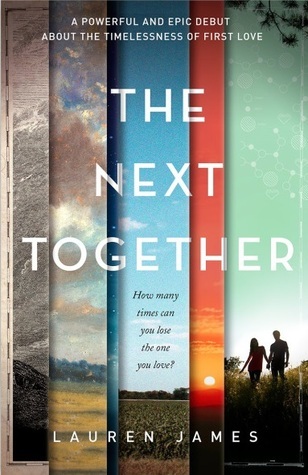 I know that a short story was recently published, titled Another Together, and I plan to get reading it ASAP because I’m utterly sucked into this mystery and I need more of Kate and Matthew in my life. This sounds like a real treat!